The undersigned is directed to refer to this Department’s O.M. of even no. dated 12.04.2017 and subsequent reminders of even no. 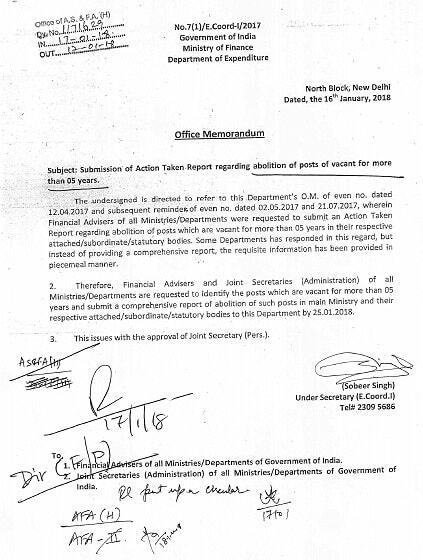 dated 02.05.2017 and 21.07.2017, wherein Financial Advisers of all Ministries/Departments were requested to submit an Action Taken Report regarding abolition of posts which are vacant for more than 05 years in their respective attached/subordinate/statutory bodies. Some Departments has responded in this regard, but instead of providing a comprehensive report, the requisite information has been provided in piecemeal manner.